When Barcelona purchased Philippe Coutinho from Liverpool back in the winter of 2018 for an eye-popping €160 million fee, Blaugrana fans thought they had found their next Andrés Iniesta. It made sense: Coutinho can dribble, create, and score all at elite levels, and though the Brazilian needed to work on his passing and patience, at just 25 years of age at the time of the transfer, he had plenty of room to do just that. The start of Coutinho’s Barça career was fairly inconsistent and inconsequential, mostly because of the timing of his arrival. That wasn’t much reason for concern. It was always going to be this season, with a full preseason at Barça under his belt and a personally successful (though ultimately disappointing) World Cup run and a gaping Iniesta-sized hole in the starting lineup, in which Coutinho would have his best chance to shine. To put it generously, things have not worked out that way. Coutinho’s main problem isn’t really one of his own making. He simply is not a great fit for the way this Barcelona team needs to play. After only a brief and failed period of experimentation, it quickly become clear that Coutinho is not an Iniesta type and cannot thrive in his predecessor’s position in central midfield. Manager Ernesto Valverde realized this early on in the season, and since then he has used Coutinho almost exclusively on the left wing, the position where Coutinho played the best soccer of his career back at Liverpool. However, because Coutinho doesn’t give Barça as much at that position as Ousmane Dembélé does, Coutinho has been relegated to something of a rotation role. He has gotten plenty of playing time thanks to Dembélé’s numerous injuries and the Frenchman’s own stylistic quirks, but Coutinho clearly lives outside the ideal Barcelona XI. For a player like Coutinho, who relies so much on freedom and confidence and importance in the team to be his best, this has made it incredibly difficult for him to flourish. Thus, in the eyes of most culés, Coutinho has been a disappointment. And yet, Coutinho’s pure talent has never been in doubt. 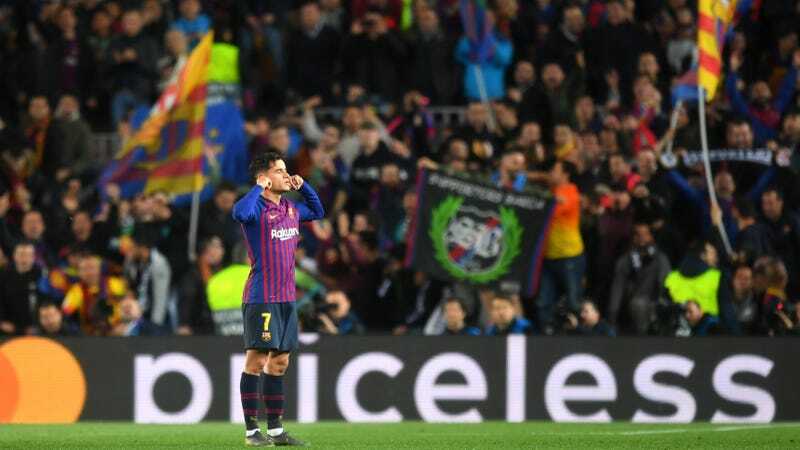 Even though he has by no means been the star Barça expected when they signed him, Coutinho has still shown flashes of his Liverpool brilliance, particularly against big teams. Since joining Barça, Coutinho has scored or assisted against Real Madrid, Tottenham, Inter, Sevilla, Valencia, Lyon, and, as of Tuesday, Manchester United. Perhaps even more notable than the goal—coming in the same week where rumors popped up that Coutinho and his camp were going to speak to Barça brass about his future—was his celebration: fingers in the ears, eyes closed, blocking out the haters on his own home ground. It would be easy to write off the goal as just a piece of random Coutinho magic; he’s scored a handful of similar goals since moving to Spain, and they haven’t amounted to much. But Coutinho was impressive even outside of that burst of pure ball-striking talent. In fact, the United match was probably his best game of 2019. His link-up play allowed Barcelona to repeatedly attack United’s back five, with poor Ashley Young overwhelmed by the trio of Coutinho, fellow Brazilian Arthur, and Jordi Alba. Maybe the haters, both of the disappointed culé variety and the United-supporting ones who let him have it during the tie due to his Liverpool past, weren’t the only things Coutinho was closing his eyes and ears from after his goal yesterday. Maybe he was blocking out the external and internal doubts about how well he fits at Barcelona, the criticism aimed his way whenever he comes up short, the calls for Dembélé to start over him, the comparisons to Iniesta, the rumors that he wants out and Barça don’t want him—all those chattering voices that threaten to get Coutinho off his game by distracting him from what really matters, which is the ball on the pitch. On Tuesday, Coutinho showed that, when he’s on his game, he can still be a key part of the success of maybe the best team in the world. If he keeps that up, and keeps blocking out everything else, the rest will take care of itself.